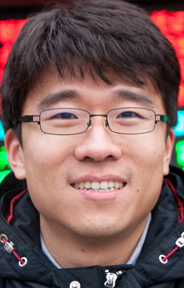 Jeongwan Haah is interested in fault-tolerant quantum computation and topological phases of matter. His work focuses on the phases of matter that can be used as robust quantum memory devices. During his Ph.D., he discovered a new topological phase of a spin system in three spatial dimensions, and a theoretical scheme to use it as a robust quantum memory at nonzero temperatures. Jeongwan's Ph.D. work at the California Institute of Technology was under the supervision of John Preskill. He received his undergraduate degrees in physics and mathematics from Seoul National University in 2008. Jeongwan is originally from Jinju, a small city in the southern end of the Korean peninsula. J. Haah, "Local stabilizer codes in three dimensions without string logical operators", Phys. Rev. A, 83, 042330 (2011). S. Bravyi, J. Haah, "Analytic and numerical demonstration of quantum self-correction in the 3D Cubic Code", arXiv:1112.3252. J. Haah, "Commuting Pauli Hamiltonians as maps between free modules", arXiv:1204.1063.